Tomi Kauppinen, Line C. Pouchard, Carsten Keßler (Eds. 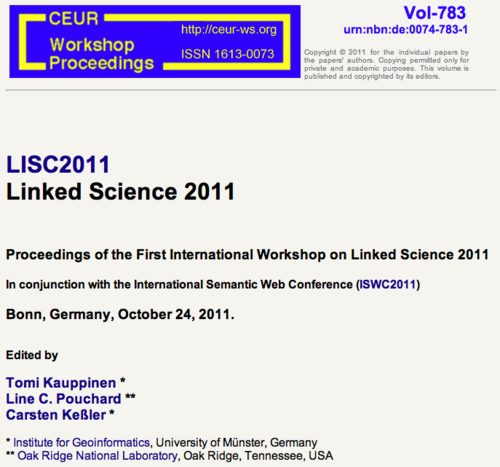 ): Proceedings of the First International Workshop on Linked Science 2011, Bonn, Germany, October 24, 2011. CEUR Workshop Proceedings, Volume 783, available at http://www.ceur-ws.org/Vol-783. The following eight papers have been accepted to be presented at the 1st International Workshop on Linked Science (LISC2011), Oct 24th, 2011 in Bonn, Germany. We received 16 submissions by the deadline—thus the acceptance rate was 50%. Paul Groth and Yolanda Gil. Vinh Nguyen, Olivier Bodenreider, Todd Mining and Amit Sheth. Sebastian Nordhoff and Harald Hammarström. Stephan Mäs, Matthias Müller, Christin Henzen and Lars Bernard. Johnson Mwebaze, Danny Boxhoorn and Edwin Valentijn. Todd Vision, Hilmar Lapp, Paula Mabee, Monte Westerfield and Judith Blake. Craig A. Knoblock, Pedro Szekely, Jose Luis Ambite, Shubham Gupta, Aman Goel, Maria Muslea, Kristina Lerman and Parag Mallick. Jim Mccusker, Timothy Lebo, Li Ding, Cynthia Chang, Paulo Pinheiro Da Silva and Deborah L. Mcguinness. The detailed program will be announced soon at linkedscience.org/events/lisc2011.